We have updated our portfolio businesses at http://www.crawcap.com/current-projects/. We are just a few weeks into 2017 and I want to explain what I believe will happen this year and what that means to all of my Portfolio enterprises. I am excited about what President Elect Donald Trump is doing to the liberal establishment in Washington, D.C. and I expect that his election will be great in fostering free enterprise by eliminating numerous and costly job destroying overbearing levels of Federal regulations. Those of you who know me know that I am an advocate of John Naisbitt who authored the book titled Megatrends that was first published in 1982 and is still in print. His message in his book was that you don’t need a crystal ball to “see the future,” and all you need to do so is to read your newspaper and other news publications. The megatrend news today is, indeed, telling us what the trends are as it applies to the capital markets. First of all I am going to tell you what is happening right now and beyond from recent articles and news stories that I believe are the harbingers of my assumptions and predictions. What I am absolutely certain of is that the timing could not be any better than it is today as it applies to the opportunities for all of my portfolio companies that I and my investors have funded over the last 10-years (two of them have been in my portfolio since 1997). There are a few factors to note first. Venture Capital firms, corporations, Private Equity Groups, Investment Banks, Money Management firms, major banks and wealthy angel investors are awash in cash. Acquisitions and mergers in 2016 have far outpaced IPOs by a factor of almost 200 to 1. Corporate stock buybacks and mergers have shrunk the number of quality stocks to invest in. The biggest single financial event in our history began in June 2007 when Apple introduced the iPhone. The smart device market today is saturated and is no longer a growing market. The remarkable part of the story is that the introduction of the game changing iPhone occurred when the financial meltdown was starting in early 2008 that subsequently, very quickly dried up access to capital. So the stock market dove but technology stocks like Apple, Google, Microsoft, Amazon, etc. soared. The year before the iPhone’s release in 2007, Apple posted an annual profit of $2 billion on sales of $19.3 billion (their fiscal year ends in September). For the 2016 fiscal year Apple reported $215.639 billion in revenues and $45.687 billion in net income which was their first drop in year-over-year revenues and net income since 2000, 17 years ago. The iPhone tech boom saved the U.S. Economy when, without it, the meltdown would have been a catastrophe. In addition, smart phones became accessible to poorer peoples which began to have a favorable effect on boosting the GNP of many very poor countries. So where is the big money going now? Bill Gurley, a partner with Benchmark recently stated “The world has never seen an investment climate like this one. It’s hard to express how much money is out there. We’re in a slow correction. You might see a unicorn go down once a quarter, instead of a crash taking them all down at once.” In an article in late October last year titled The Slow-Motion Bust in Business Week written by Max Chalfkin he wrote “Most startup investors, however, expect several years of relative stagnation, which is why many are looking away from the crowded field of consumer software and toward companies focused on business services, where they see more stability and growth potential.” The IPO market will continue to shrink, acquisitions will continue to rise and the focus for “big money” investments now are focused on “cloud based” software business that have already established their “niche” and their uniqueness and are at or close to becoming a sustaining and rapidly growing profitable business. In addition, the VCs et al, have to believe that a significant capital infusion will allow the prospect business to more quickly ramp up in the market it is in and possibly enable the prospect business to enter other markets as well. What does this fact mean to my portfolio companies? All of my portfolio businesses are in the “sweet spot” of just what all the “Big Money” is looking for. Empathic Clinical Suites and LocaLoop are especially prime candidates to be acquired. They have proven technology, they are both fundamentally; recurring revenue, cloud based, software services businesses. More importantly, they are both fast growing and have no peers in their targeted markets and they are close to achieving the proverbial hockey stick of extremely fast ramp-up growth. Biothera Pharmaceuticals has been in my portfolio since 1997. On January 6, 2017 Biothera CEO, Barry Labinger sent a letter to their shareholders to summarize their efforts to go public which they had announced at a shareholder meeting in April 2016. They pointed out that 2016 turned out to be the second-worst market for IPO’s since 1992 and that it was a dismal year for biotech IPOs too. And they noted that almost all of the few biotechs that did go public since the first quarter of 2016 now trade below their offering price and that fact negatively impacted institutional investor sentiments regarding future IPOs and related pre-IPO institutional investments. The letter went on to note that they are continuing to work with Citi-Group and are set to move when the biotech segment is ready. In the meantime they are continuing to generate meaningful data from ongoing clinical trials which are under research collaborations with Merck and other pharma enterprises and they are right in the middle of what today is the biggest event in the cancer segment of the pharmaceutical industry and that is “Checkpoint Inhibitors” and immune health. What Biothera is doing now is exactly what they should do to achieve a liquidating event either through an acquisition or by going public. Following are quotes from cited publications that confirm what I am predicting. Keep in mind that, as I noted earlier, there are huge caches of cash in corporations, Venture Capital Funds, Hedge Funds, Index Funds and numerous financial institutions that are all looking for the next hot new deal. Below are a few of the cited articles that are the megatrend stories of today that support my conclusions. Chafkin further states, “A few years ago, a big VC fund might have had about $500 million to play with. Today, ‘big’ means well over $1 billion. VC’s raised $12 billion in the first quarter of 2016, which the industry’s trade group says marked a 10-year high.” He quotes Bill Gurley, a partner with Benchmark who led the firm’s investment in Uber, “The world has never seen an investment climate like this one. It’s hard to express how much money is out there. There was another article posted on January 6, 2017 by Mark Fahey who is a data journalist and graphics editor at CNBC titled Why buyouts are blowing away IPOs when investors want to ‘cash out.’ He says “It’s been a while since we’ve had an Alibaba. In fact, it’s been at least a year since we’ve had an initial public offering that raised as much as Facebook ($16 billion), Hilton Worldwide ($2.7 billion) or even Twitter ($2.1 billion). And yet, we can’t go more than a few months without a major corporate acquisition. In 2016 Microsoft bought LinkedIn, Tesla bought SolarCity, and over 1,000 other companies changed hands, often for billions of dollars. That includes hundreds of smaller private companies that in the past may have opted to go public. Something has changed in recent year – IPOs on American exchanges were at their lowest level since the recession, while mergers were at their highest level. For every dollar of IPO proceeds, $143 was spent last year on mergers and acquisitions, the highest that ratio has been in nearly 30 years, according to CNBC calculations. I have always said that the most important thing about any early stage business is its timing to uncontrollable events. You can have a poor technology and still have a big win just because of the timing. What is clear now is that Empathic, LocaLoop and Biothera Pharmaceuticals are in the right place at the right time. This fact will become very clear throughout 2017. In early September I spent a week in northeastern Arizona with Linda Brimhall, who founded SynKroMAX Internet. They are located in the town of Taylor in Navajo County and is one of LocaLoop’s newest and rapidly growing customers. 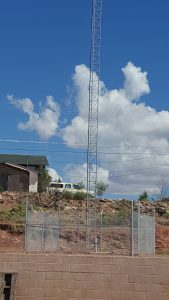 All of northeastern Arizona, which includes several large Indian Reservations, is woefully lacking in access to high-speed broadband Internet. LocaLoop’s cloud based system is the ideal solution for that problem. Most of the towns and cities located there today were founded by Mormon’s in the 1800’s. And many of these towns were named after the founding person or members of the Mormon leadership. John Taylor was one of the early Mormon leaders following the settlement of the Church in Salt Lake City. The town of Taylor was named after him. Snowflake, which is adjacent to Taylor, was founded by William J. Flake. More Mormon settlers began to move from Utah to the new settlement. Later, Erastus Snow visited the settlement and a few days after he arrived he sent a message back to Salt Lake City saying that he was naming the town Snow Flake and today it is known as Snowflake. I had two reasons for going there. One was to meet Linda Brimhall, a true entrepreneur who is executing her business plan perfectly. The second reason was to meet some local accredited investors who might be interested in investing in LocaLoop’s current private offering. Attached is a copy of an article from the Tuesday, April 12, 2016 Business Section of the NavApache Independent Newspaper about Linda and her new high-speed, broadband Internet business which is powered by LocaLoop. I am glad that I made the trip and I learned a lot about LocaLoop’s business model and discovered how really simple it is. I also saw how it runs a complete broadband Internet service business for the operator with just a few people. Note the attached photo that I took of the business itself. 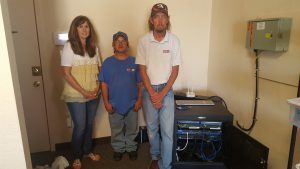 In the photo are Linda, her technology expert Mel Larson (the taller guy), his assistant Michael Davis and LocaLoop’s Internet network box. There is also a photo of the first antenna located just outside the office that is connected to the box. That small team and LocaLoop’s “business in a box” can grow well into 2017 and beyond. What is really remarkable about what she is doing is that her first tower became live in March and LocaLoop is assisting her as she is installing her fourth tower right now that will start offering subscriber access in October. She already has 50 customers lined up for the new tower. She is on track to have 200 subscribers by the end of 2016. She is planning to hire another office person to help her manage the growing number of calls from people who want to sign up for the service now or will do so when she has a new tower site that covers the new subscribers location. Her overall business plan is to add at least 4, and maybe more, additional towers in 2017. Her current plan today is to have a total of 15 towers operating by the end of 2018. Also attached is a site map for the 15 towers. She is also in the process of filing for grants including some that may be available for 4G wireless broadband Internet connections on specific Indian Reservations. One of the people Linda and I met with asked me if local investors should invest in her business or in LocaLoop. I told him that, if she needed additional capital then they should consider investing in her business because such an investment is really an investment in their own community. I also told them that in either case they should consider investing in LocaLoop because LL’s cloud technology and wireless expertise is what is essential to empowering rural entrepreneurs to bring an affordable, 4G, wireless Broadband Internet service to their own underserved area. I later reviewed Linda’s business plan and told her that, with the assets she has, it appears to me that she doesn’t need to raise any additional capital through 2017. If she does need additional capital beyond that time frame it would be reasonable to assume that her business then would be valued much higher which would reduce the percentage dilution of her ownership. She seemed to be relieved to know that she does not need to raise any additional capital today. And, her operating statement indicates that her business will be profitable enough at the end of 2016 to start paying her a reasonable salary. LocaLoop’s numbers of customers and revenues are growing fast. They have had 4 consecutive months of profits and, as of the end of August, they had their first ongoing, annual profit. In addition, their monthly recurring revenues from subscriber fees are growing. In August 2015 LocaLoop’s recurring subscriber revenues amounted to $1187 and their August 2016 subscriber revenues totaled $15,452. They now project to become a sustaining business by the end of 2016. LocaLoop is seeking to raise capital to cover their growing vendor equipment expense and to keep up with the growing demand from underserved areas all over the U.S. They have filed an S.E.C. Form D Private Offering for up to $2 million in 8% convertible notes. This is the ideal time for qualified investors to consider making an investment in LocaLoop. Please let me know if you want me to arrange to have them send you the information on how you can participate in the current offering that is being handled through Broker Bank Securities, Inc. which is a FINRA Registered Firm –CRD #130116. My plan is to start either a Hedge Fund or a Private Capital Group that will invest half of its capital in Bitcoins or other equivalent virtual currencies and the other half in enterprises. The Bitcoins will be utilized to provide capital to third world entrepreneurs and the dollars will be used to invest in going concerns and early stage ideas that have relevance in the virtual world. At this point I want you to let me know if you would like to know more about this opportunity when I have it fully planned and structured. I expect to be able to do that within 4 to 6 months. Be sure to read the following article and the two attached articles. Connect with our Twitter & Facebook. The problem with the current worldwide financial system is that it doesn’t reach the most impoverished people who live a subsistence day-to-day-to-day life where there is no currency and no real monetary system. In late 2009 I sent many of my clients an article from the September 24, 2009 issue of The Economist titled The Power of Mobile Money. The article discussed how mobile phones had evolved in a few years to become tools of economic empowerment for the world’s poorest people. The “currency” in cell phones are prepaid minutes which are called “Top Ups.” The top ups are retained in the users account which means they will not be consumed by their phone use so that they can be stored away. I have attached a copy of the referenced article for your review. And don’t forget that the article itself was written in September 2009. You should also do a search on M-PESA or its parent Safricom, which will give you more information of how fast this unique financial system using prepaid call minutes has grown between 2009 and today. In addition it will convince you that Internet based currency is a really big innovation that is creating a huge investment opportunity. In the following Star Tribune article it says “In its fourth year of circulation now, the decentralized online-only form of money has evolved from a libertarian-styled geek curiosity to a contender for becoming the first digital currency to go truly mainstream. There are now more than 11 million “coins” created worth more than $1 billion. Lumpy and volatile as it is, the math-based cash is one of the fastest rising alternative currencies in a world filled with them.” In the attached Business Week article it says “A Bitcoin’s not so much a thing as an understanding, a balance in a decentralized general ledger, or ‘account log.’ Bitcoins are created as the side effect of a great deal of meaningless computational work. That is, the computer could be working on protein-folding, or processing images, or doing something else with its time, but instead it’s being used to ‘mine’ Bitcoins – searching for mathematical needles in a networked haystack. Once the needle is found, a ‘block’ of Bitcoins is born. Bitcoins live in a bit of software known as your ‘wallet.’” Later it says Bitcoin is no different than an exchange traded fund that has a mix of non-US currencies as a hedge against the entire global currency system and no exchange is needed, unless you want to convert your Bitcoin into an actual hard currency. What is extremely noteworthy to me is that virtual currencies will ultimately allow entrepreneurs to leverage themselves. For example a person who is a house painter could raise capital on their talent. That will also be the case for those who live in the developed world that have no access to capital. Virtual “cloud based” money is a huge evolution in the world of commerce and is an enlightening moment in history. These types of Internet based innovations are great for LocaLoop because they cannot work unless there is ubiquitous mobile, 4G, high-speed broadband Internet connectivity available all over the world and particularly in the underserved world. Continue reading in Paul’s next Blog post in a few days! Connect with our Twitter & Facebook so you don’t miss it. Following is a copy of an article in the Sunday, June 9, 2013 issue of the Star Tribune newspaper titled Bitcoin has more staying power than other digital currencies. Also attached is a pdf of an article from the April 1- April 7, 2013 issue of Business Week titled The Bitcoin of the Realm. Both articles are about Bitcoin which is a form of virtual cash. I have predicted for the last several years that the Internet would replace credit cards and that is happening in a big way today. I have also predicted that the Internet would ultimately replace cash. And Bitcoin is very likely going to be one of the major players among virtual money enterprises. The advantages that are gained by transferring credit cards to smart device apps is the elimination of credit card processing fees (i.e. the middleman) and link you directly to a specific bank (the issuer of the credit cards.) This gives both merchants and credit card users a better and less expensive deal. And, in app form, it is more secure and much safer from harmful credit card theft. You may think it is a stretch to leap from a very complex worldwide money system to a virtual cash system that is backed by nothing other than the willingness of others to accept it as payment for goods and services. You also have to understand that the most fundamental and basic commerce throughout the world is still done through barter. International trade for centuries was based on barter and began to change with the invention of coins. Originally coins were valued based on their content of precious materials, particularly silver and gold. Ultimately that led to the evolution of storage facilities to hold your surplus coinage which evolved into banking. And then banks began to pay depositors interest so that the bank could use what are called “footings” or deposits to produce more money to lend and to acquire hard assets (gold, silver, etc.) which would create additional value for added loan capability. The evolution of banks led to the creation of banks for banks. The creation of a Federal Bank for banks in the U.S. became a reality after the Revolutionary War thanks to the wisdom and insistence of Alexander Hamilton. His idea was genius and really allowed the newly established U.S. Government to borrow from major banks in Europe and Great Britain and to print money to pay its debts. Thus was born “the full faith and credit” doctrine that propelled the U.S. into becoming the biggest economy in the entire world in a little more than 100 years from its founding. Find the Star Tribune article on Bitcoin right here. Often regarded as a new centralization of computing, the new architecture in fact unleashes huge new efficiencies and opportunities on the edges of the network, impelling vast new tides of traffic across it. We have been aware of this for quite some time and that is why we have been concentrating on ideas that take advantage of this tremendous opportunity to launch new businesses that can build huge recurring revenues from, what Guilder calls “huge new efficiencies and opportunities” that will enable entrepreneurs to offer more efficient services over the Internet. Cloud computing will enable entrepreneurs to develop special applications Software as a Service (SaaS) over the Internet that can generate generous recurring revenues with huge profit margins. What’s more is that many of these highly profitable new businesses will service markets that become virtual communities as well.